Is the library taking school taxes away from the school district and my children? No, the school district is collecting library taxes on our behalf as per New York State Law. This money is in no other way connected to the school budget. Library taxes are voted on separately from the school district. How are other libraries in the area funded? 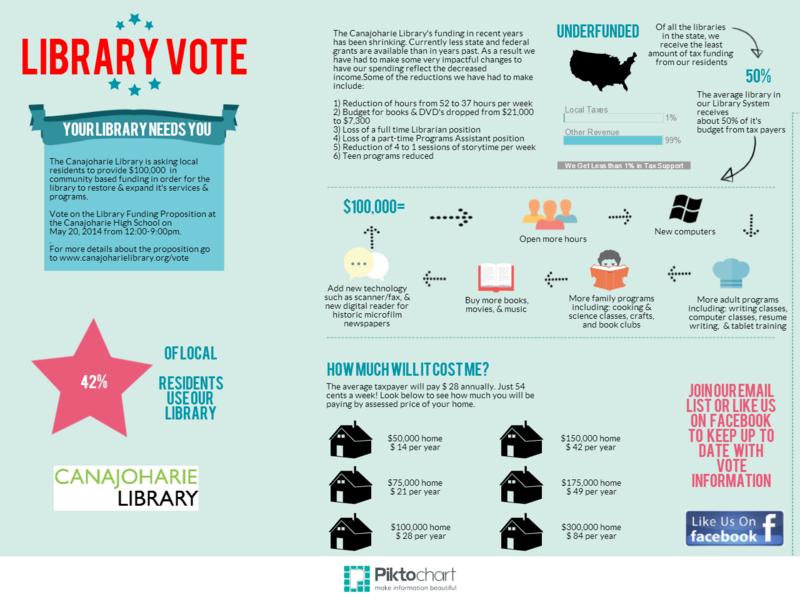 The average library in the Mohawk Valley has 50% of it’s annual budget funded by local taxes. Our library, less than 1%. Some libraries hold votes similar to what we are doing, while others are directly supported through local government. It seems like a bad precedent to allow this tax. What is next? Our library receives the least amount of money from taxes in the entire state of New York. Currently we receive only 15 cents per person ($950 a year) to run the library. If this tax is voted in the library cannot raise the tax without first putting another budget vote to the community for them to approve much like school district's do. Libraries typically only seek increases every few years in order to cover the increased costs of running a library. Why should the town foot the bill for the museum? The library and museum do share certain expenses to operate the library and museum. However we both have our own separate budgets. The $100,000 we are asking for will go directly into the library budget and absolutely none of it will be spent by the museum. Why can’t the library just fundraise the money it needs? In 2013 library staff and volunteers worked hard to hold several successful fundraisers. Over $12,000 was raised and put into the library’s operating expenses and book buying budget. While volunteers will continue to raise funds for the library they cannot be expected to raise anywhere near enough to cover operating expenses. The Arkell Hall Foundation has been very generous to the local community. They 100% funded the 2007 building expansion and continue to donate $100,000 a year to our operating budget. The Foundation donates to many local/regional organizations and projects. We do not expect for them to discontinue their mission of donating in the community just so that they can funnel all their money to the library. Local residents should not expect this service as well. He did in fact love his community very much and did set-up an endowment that the library shares with the museum. Over the years the cost to run a library have increased while the endowment has not grown at all, add into that a bad economy and you get less revenue from our investments. Bartlett Arkell gave this community a wonderful gift but he also expected everyone to help out in keeping it around for future generations. The library has grown and changed over the past 5 years. We encourage you to come in and explore what we have to offer you. Even if you don’t use the library the presence of the library enhances the value of your property. It is a major attraction for new residents looking to purchase homes in this area. So, even if you aren’t taking advantage of the library, you are still reaping the benefits.